The European Science-Media Hub (ESMH) summer school “AI and journalism” will take place on 4-7 June in Strasbourg. The event will provide an overview of AI and journalism, exploring some selected issues like algorithms and ethics. The programme will include hands-on trainings on the use of new technologies for digital communication as well as discussions of case studies on the potential impact of AI on journalism and communication. 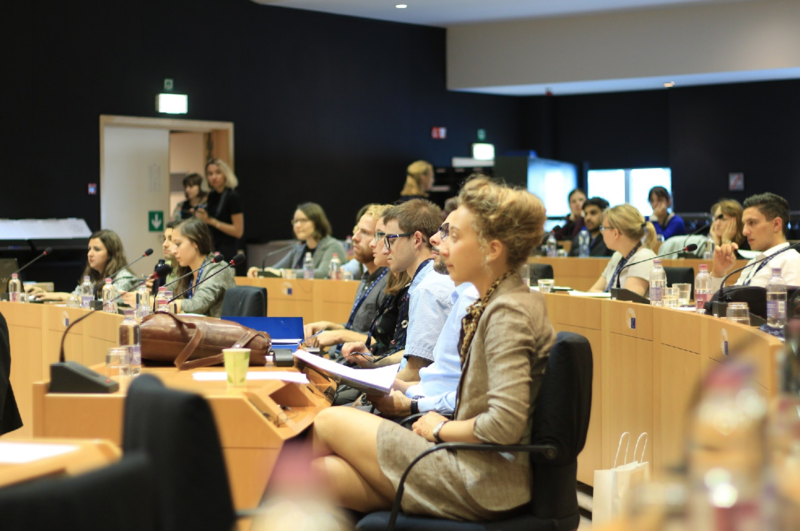 The European Youth Press invites applicants to become one of the 80 young journalists (30 journalism students and 50 working journalists), aged between 18 and 32/35, who will report from the European Parliament in Strasbourg. The application is open to young journalists who are citizens of the EU Member States. The ESMH summer school for young journalists “AI and journalism” will be the first of this kind and it falls within a wider overall ESMH training plan. This year the summer school will take place in the European Parliament seat in Strasbourg. Participants will experience three days of media workshops, political discussions, hands-on media production and invaluable insights into the European Parliament and international media milieu. They will interact with high-level European politicians, professional journalists and experts and engage in intercultural exchange through practical media production. through their medium of choice. The topic “AI and journalism” will be addressed in workshops with professional journalists and experts and in three panel discussions on the subject with international experts, Members of the European Parliament and other high-ranking guests. The ESMH summer school will give the freedom to critically and constructively think about, debate and journalistically cover opportunities for today’s media and challenges they face, as well as the topic of the AI and the future technology. Each of the participants will be part of one of the ten groups led by a facilitator. The call is open to young journalists aged between 18 and 32/35 who are citizens of an EU Member State. The event will be held in English, so a working level of the language is required. Journalists with at least three years of professional experience working/freelancing for media. A focus on science journalism would be desirable. There are 40 positions open for this role. Students enrolled in a BA, MA course/PhD in journalism or communications, or who have completed a master’s degree in journalism or communication in the previous two years. There are 30 positions open for this role. The call is open to journalists aged max 35 who are citizens of an EU Member State. At least five years of professional experience working/freelancing for media is required for this position. A very good knowledge of English is necessary in order to communicate with participants coming from the EU Member States. Previous involvement in other European Youth Press projects is a plus. There are 10 open positions for Media Teams Facilitators. Facilitators will be managing a group of max 10 young journalists working on a specific media outcome. They will be planning the coverage in their groups before the event and following the progress during the event, maintaining team dynamics, editing the media outcomes and making sure they are delivered on time. Media Facilitators will report to the Project Coordinator. Participants’ travel costs will be reimbursed by the European Parliament after the event, upon submission of all necessary documents. More detailed information will be given after you have been selected. Specific reimbursement conditions will apply and overall guidance, including instructions and forms for completion will be sent by the European Parliament prior to the event. For working journalists (who will need to provide a press card, or letter of instructions from an EU media to complete and validate their registration after being selected), the European Parliament will also pay up to three overnight allowances (180 euros per day, 540 euros in total) covering accommodation, meals and local transport. The same conditions apply to facilitators. For students (who will need to provide a copy of the ID card + document from the University about their student status to complete and validate their registration after being selected) the European Parliament will also pay up to three overnight allowances three overnight allowances (90 euros per day, 270 euros in total) covering accommodation, meals and local transport. The allowances will be paid at the same time as the travel reimbursement, after the event via bank transfer. Attention: for participants residing in Strasbourg no daily allowances or travel costs will be paid. Facilitator’s applications – use this form. Participant’s applications – use this form. Highlight how you comply with the profile we are looking for. Please don’t send us any application documents via e-mail or post, as we cannot take them into consideration. Application deadline: April 19, 23:59 CET. Please, mind that emails without right subject line will not be considered. We are looking forward to working with you at the European Parliament in Strasbourg!